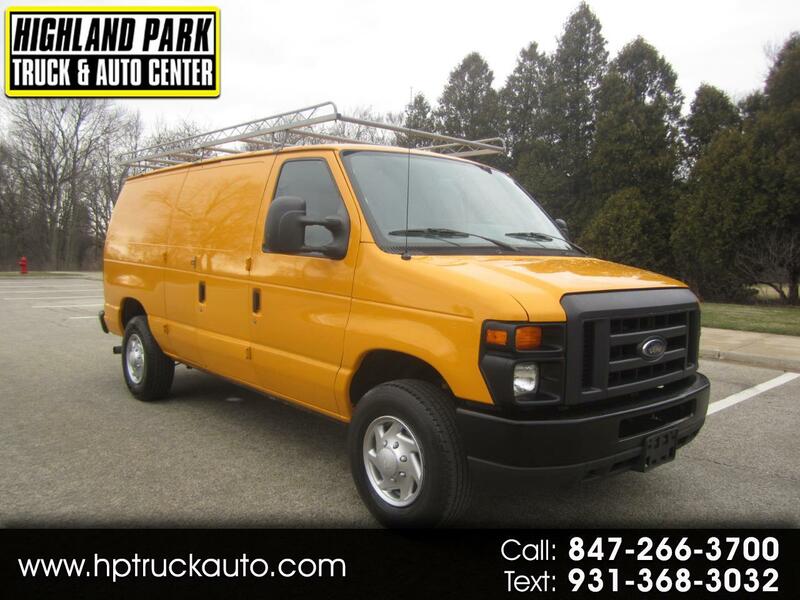 A GREAT RUNNING 2013 FORD E-350 1-TON CARGO VAN!!! THE 5.4L V8 RUNS GREAT!!! AUTOMATIC TRANSMISSION SHIFTS AS IT SHOULD. VAN DRIVES NICE TIGHT AND STRAIGHT. NO WINDOWS TO KEEP ALL OF YOUR TOOLS SAFE. INTERIOR RACKS AND BINS. COLD A/C FOR THOSE HOT SUMMER DAYS. CD PLAYER AND BLUETOOTH. A GREAT ONE OWNER HEAVY DUTY CARGO VAN READY TO WORK!!! MANY GREAT VANS AND TRUCKS IN STOCK!!! HIGHLAND PARK TRUCK CENTER IS LOCATED ON RT 41 JUST NORTH OF RT 22 IN HIGHLAND PARK, IL. 20 MINUTES NORTH OF CHICAGO AND JUST 20 MILES FROM IL/WI BORDER. CAN'T MAKE IT IN? NO WORRIES, NATION WIDE SHIPPING AVAILABLE!! DISCOUNTED SHIPPING RATES TO ANYWHERE IN THE U.S- LET THE VEHICLE GET DELIVERED RIGHT TO YOUR DOOR STEP. ALL VEHICLES HAVE BEEN SERVICED AND INSPECTED PRIOR TO SALE. JOHN "THE VAN MAN" IS KNOWN FOR THE BEST VANS AND TRUCKS AT THE BEST PRICES. HAVE BEEN SUPPLYING THE WORKING MAN WITH HIGH QUALITY WORK TRUCKS FOR OVER 40 YEARS. OUR CARS AND TRUCKS SELL THEMSELVES, NO HIGH PRESSURE SALES, YOU BUY WHAT YOU WANT, WHEN YOU WANT!!! HUGE SELECTION OF PRE-OWNED LIGHT AND MEDIUM DUTY TRUCKS. ALL CARS AND TRUCKS ARE WHOLESALE PRICED. VISIT US ON THE WEB @ WWW.HPTRUCKAUTO.COM OR CALL TODAY -847-266-3700 - 847-912-8267. NO JUNK SOLD HERE, QUALITY PRE-OWNED CARS AND TRUCKS AT GREAT PRICES!! !